You'll be £19.99 closer to your next £10.00 credit when you purchase Rendezvous With Death. What's this? 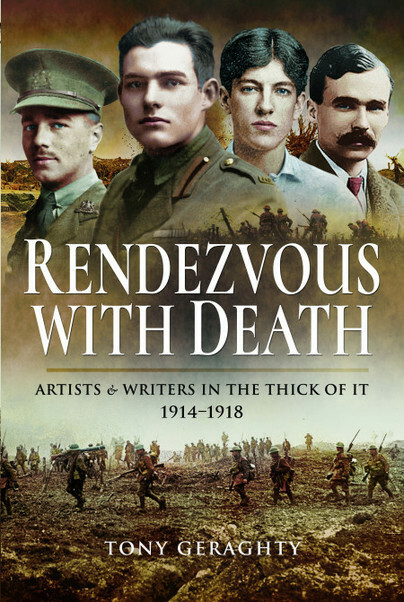 This book sheds new light on the colourful personalities including Wilfred Owen, Rupert Brooke, Alan Seeger, Ivor Gurney, Edward Thomas, Isaac Rosenberg, Ralph Vaughan Williams and George Butterworth, all major figures among Englands creative artists during the First World War. One of the many strengths of this book is that, on the one hand, it provides a summary of the experience of each of these men, but also helpful how it fitted into the wider experience of war. It is a valuable addition to the wider story of the Great War. All in all a really enthralling book and, as he is now in his eighties, Tony Geraghty is to be congratulated. The writing is entertaining, littered with odd facts and observations and offering a different and interesting take on the Western Front experience. A highly readable book that looks at the First World War from an unusual perspective. So what does this book reveal about these exceptional talents? Firstly,one is struck by the variety of backgrounds and motivations. Whilst many were inspired by romantic ideals of war and death, the life experiences that took them into the trenches were many and varied. brutality. Clearly bullets, bombs and bayonets did not discriminate between those who had exceptional talent and those who did not. Finally, creative output aside, this reviewer was given cause to reflect that, in other aspects, these are twelve individual stories just like the stories of the other 5.6 million service personnel who served with the British forces in the First World war – each forged by a common experience but every one unique.